Are you struggling to compete in a crowded online niche? Set-up a simple TV-video studio in your house or office and dazzle your fans with videos that show off your products or services. A studio allows you to create lots of videos quickly. Set up your own shopping network. Seriously, you could with a simple, but well organized video production studio. Look at QVC with the mind of a TV producer and what do you see? A couple of people sitting on a simple set, holding up products, and chit-chatting non-stop. How easy is that? Setting up a studio allows you to crank out lots of videos quickly. Studio production method uses multiple cameras and microphones at once. It’s all edited live, on the fly, like a live TV show. This saves TONS of time in editing. Post production editing is incredibly time consuming and studio production eliminates it. “Live-to-tape,” or “as-live,” is an expression in TV production that means it is done in a live manner but recorded for playback later. If you make minor mistakes, you keep going, just like you would if it were live. Live-to-tape is a great method because it is fast and inexpensive. All studio production, even if you do edit it some later, is MUCH faster, and therefore cheaper than standard field production, which is one-camera technique and post-production editing. WHAT EQUIPMENT DO I NEED TO SET UP A VIDEO STUDIO? Today, an entire video studio can be run using one high-powered computer. The process can be referred to as desktop video production and the possibilities are incredible! Here is a video tutorial demonstrating such a system. This video profiles a small country government TV production department that uses a NewTek VT5 to create finished programs that rival what it used to require a much larger operation to produce. One of the most popular programs created by this small gov’t station (Williamson County TV, or WC TV. I used to work there!) is high school football. The small crew of high school video production students is able to produce broadcast quality shows using the VT5. Watch the video and you’ll be impressed at the incredible quality of this high school football game video. Without a system like the VT5, such production would simply be out of reach for this small school system crew. Below the video, there is a long post and many comments about more tradition video studios. These studios require a multitude of components, such as a video switcher, an audio board, and video record devices. You can learn more about the NewTekVT5 on this post here at Video Production Tips. Even though the methods themselves are very different, much of the equipment needed to set up a studio is the exact same needed for field production, you just need more of it. If you want to do both studio and field work but don’t want to buy two sets of equipment, you don’t have to. Much can be the same. You’ll just have to get used to putting your studio together and tearing it apart again. Think of all the great exercise! Typically, a TV studio has at least three cameras and some way to switch between the cameras live as the show is happening. Editing live is an incredible time-saver. Using multiple cameras and a video switcher (or computer software) to edit your show on the fly was originally invented in Hollywood when TV came along as a cheaper and faster way to produce shows. Movies had traditionally been made using one-camera technique and still are today. If you are going for meticulous high art, one-camera technique allows you more precise control. Studio technique is primarily done for budgetary reasons. Although many variations are possible, every video studio follows this basic layout. Usually, a TV studio is divided into at least two rooms. 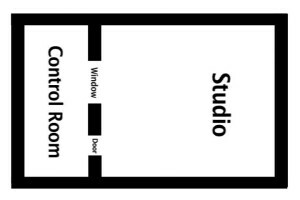 The studio where the lights, camera, and action take place is next to a separate “control room” where the director and technicians are. It helps for the control room people to be able to see into the studio so a window is usually built in. Keep sound proofing in mind; you don’t want the control room noise to be picked up by the mics in the studio. If you are a lower budget operation, the biggest concern you should have is locating in a quiet place where you have as much room as possible. You also need to have control over the lighting and sound. Rooms that are built for the purpose of a video studio would be built without windows to maximize lighting control. Usually, a video studio will have lights mounted on a heavy metal ceiling grid. That way you can easily put them wherever they’re needed. If you do not have a full grid, you can hang lights to some types of ceilings using c-clamp-like mounts. Lights hung from the ceiling give an angle to the light that seems natural. Plus, hanging lights from the ceiling keeps them out of the way. Run your cords along the ceiling and then tack them down the wall. Lights hung from the ceiling is the best way to do it, but is not 100% necessary. You can use portables. Portable lights on stands take up more room than those mounted on the ceiling but your shot will still look OK and that’s all that really matters. HOW DOES A TYPICAL VIDEO STUDIO OPERATE? The director or technical director operates the video switcher, going from shot to shot when appropriate. The director also adds graphics when appropriate. All video sources are plugged into the video switcher and are under control of the director. A large operation will have separate components and operators for graphics, pre-recorded tapes and other sources of video such as satellites. A small operation can get by with one director and all the cameras locked down on tripods. Today, powerful computers can take the place of all the video and audio switchers and graphics components, which makes it even easier to set up a portable studio. You can do it either way. Set furniture- usually something homey. Avoid detailed patterns. Go for solid colors that blend. Synch up all the video during editing and choose the best shot. You can do this easily by stacking the synched video lines on top of each other. Then just chop out the video shots you do not want, leaving whichever one of the three is best on top. If you do this correctly, it’s actually very fast, not at all time-consuming like the old cut and splice method or the analogue methods used for editing years ago but now obsolete. If you want even more detailed information on the equipment you need to set up a functional video studio, see this post. It contains an even greater amount of information specifically about the equipment needed than this post. Thanks for reading Video Production Tips. I always recommend shopping and researching video equipment at B&H Photo. They carry absolutely everything and have great prices too. Can Final Cut act as a live video switcher? Can Final Cut Pro act as a live switcher? I have used final cut as a component of a studio doing live shows. In our case, we used it for graphics, not as a live video switcher. Although final cut can do a lot, I can’t see using it as a live SWITCHER. It’s not meant to function in the same way. I do not think you could input multiple video cameras live into final cut. You can get real cheap simple switcher for your cameras and other video generators. Then a computer with final cut can be inputted into the switcher as one of your video sources. Thanks for visiting my blog, I hope that answer helps you. Cost depends on what you buy. On the web, B and H Photo is a great place to research video equipment. They have EVERYTHING. please could you ket me know the kind of light i would need for a video studio that is approximately 15×15 ft big? wpuld also need recommendation for mics….. It would be great if the light/ equipment specifications are specific…. Is this studio going to be a permanent set up or something that you need to be mobile? Specifically what you buy will depend on that and many other factors. For a 15 x 15 studio, you would probably want at least 3 lights. Make sure to buy diffusion equipment with them, such as soft boxes or umbrellas. Soft boxes give a more diffused light and are more expensive than umbrellas. Go to B&H photo and look at their light kits. You can buy a kit with all the lights and accessories you would need. You do not have to buy them one by one. Lowell is a really good brand, but then again, I’ve never known of a “bad” brand of lights. As for microphones, you probably want Sony lavalier mics. They start at about $150. Sony lavalier mics are really good for the price. Those would be wired microphones. Wireless are much more expensive and are usually not needed in a studio. Buy one microphone for each person that will be speaking. I am looking to re-vamp our current small studio. I use a very dated Trinity computer-based video switcher. Is there anything like it on the market today? Thanks! I just looked on the B&H photo website and they had 84 pages of results for video switcher. Each page had about 10 pieces of equipment so roughly that is 840 video switchers to choose from. The computer based ones of today are great because they have the capacity to replace the need for a graphics generator and audio switcher. they are very versatile and make remote video production much easier. Lorraine Grulas last blog post..Online Video Marketing: What is Good Enough? Director to run video switcher and supervise the floor manager. Audio engineer to place all the mics and run the audio board. Graphics person to run the graphics generator. Video tape operator to run the machines used for videotape inserts. Needless to say, that is a lot of people and may not be practical for a small operation. If the shows you are doing are simple, you can get by with far fewer people. I have actually run a small studio entirely by myself. I ran the video switcher during the show and set up everything before the show myself. Cameras can be locked down in a standard shot. Mics can be preset. By “simple show,” I am referring to something like a talk show with one host and one guest and no one moves out of their chair. For something that simple, having all those crew members would be overkill. But if you are recording a rock band with an audience and the musicians are dancing around all over the place, you would need most of those other positions. 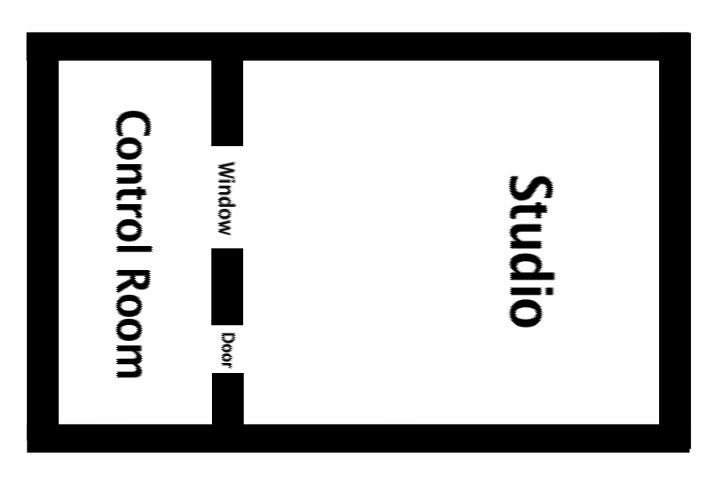 We have designed a studios in our new office building (30′ x 20′ – including control room). The cost of insatllation seems high…around $200K. Is that normal? Do you have any recommendations for installation experts in the San Diego CA area? What are your thoughts on the following equip. Any recommedations where to find good pricing? Would looking for “used” equipment be worthwhile, and if so, any suggestions where?? Many thanks for your thoughts!! $200,000 is indeed high. I assume that cost includes all the equipment. Are you buying everything from one company and having them install it too? When I worked for the school system (it was a rich county) we outfitted nice TV studios in our schools for about $70,000 to $100,000. These were VERY nice studios that easily would be appropriate for most corporate video settings. They were not much if you compared them to what NBC or CBS has, but you know, all things are relative! B&H Photo is one of the best places to research and buy equipment. They carry EVERYTHING. I am sorry but I do not know anyone in San Diego. Used equipment can be a great thing, but like with used cars, you can run into trouble too. If the person doing the buying knows a lot about equipment it can help you save LOTS of money. If you want to come down off that $200,000 price, I know you could do so if you went for less expensive equipment. Do you REALLY need HD cameras? What are your videos going to be used for? Video equipment can be terribly expensive and no doubt you could get yourself a multimillion dollar studio if you had that much money. BUT, if you do not want to go as high as $200,000 you do not have to. If you want more information, and if you want me to research all the equipment you listed and recommend alternatives, use the contact us to send me an email. Or, you can just write videoproductiontips@gmail.com. I am trying to put together a list of items and potential costs needed for a 9-month news broadcast for a small university’s journalism program. My main question is about having a virtual set vs. the standard news desk. What sorts of cost differences are there? Additionally, what sorts of equipment would the virtual set require? The plan is to have some sort of green screen regardless of set type. Any thoughts? Thanks. Thanks for visiting video production tips! You do not say what your budget is, but I bet it is tight. You can get all kinds of virtual sets that look spectacular that do not cost too much. Since you are going to have green screen anyway, seems to me that might be easiest and give you the most variety. What a “real” set costs depends on what you put in it. Back when I taught video production in a high school, we were able to get an old news set from one of the local TV stations that was building a new set, so it was a free donation. It looked awesome and the students thought sitting behind a news desk they had seen on TV a million times was quite cool. If you built a real set, you would probably not be able to afford one that is professionally built. Hiring professionals to do it would cost a FORTUNE. One of the TV stations I worked for had a set that had cost over a million bucks. They WAY over spent in my opinion. On the other hand, I’ve seen simple sets with nothing but stuff from Goodwill that looked reasonably good and only cost a few hundred total. How much room do you have? That might be a consideration too. To do a virtual set, all you need is the green screen background and the image of the set. I’ve seen real desks added to those sometimes but not always. The virtual sets can really be spectacular. Thanks for all the tips. You do a lot of writing…that’s very kind of you to share your knowledge with us. Well, I am very new to all this… and I have this project of making a simple studio but that works good as a start. Your post was perfect because I was looking at what I need to set up a simple studio and didnt think it was going to be so hard to find the answer online…but as a matter of fact it was. So thanks to you I’m done looking. I will do some research for the list you put up, but I was wondering at an avarage price I should be aiming at. Since there are so many options and I am new to it all, it becomes hard deciding on what to get. My budget will come from donations… but I am looking at 15-20K. Is it possible to get something with this much? Can you tell me how to find the computer based video switcher? So glad to hear from you and so glad video production tips could help you! You can get a decent video production studio for 15-20K, but you will need to watch your budget. 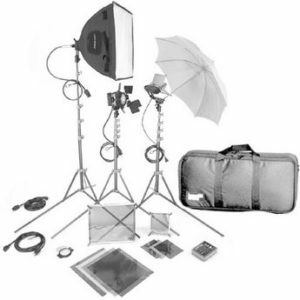 Decide exactly which pieces of equipment you will need for your studio. Do you want 2 cameras or 3? Then you can start dividing your money up realistically. Then you can look for stuff in that price range. If you get wired mics instead of wireless that will save money. You can get great cameras for 2,000 or even 1,000. A couple of simple lights will do. I always turn to B&H photo for video equipment. They carry everything. You could probably even get a sales rep to help you make decisions. Do you have any experience with “channel storm live channel pro”? Would you recommend any other? I have B&H up already. I have heard great things about channel storm live channel pro but have never personally used it. It sounds excellent. Good luck setting up your studio. I’m so happy to have come across this site. Talk about GREAT INFORMATION! You are the best, to take time out and write out detailed information as much as you have above. THANK YOU! Well here is the deal, as many above, I am working on setting up a simple video production studio-or so i think! I would like to offer video & photo shoot servces. I also want to use this to record talk shows. So my perception is, I need a studio(photo & video shoots), control room, editing room. I have compiled the list of equpemnts and matched them to the ones listed above. I want to get your input on makes & models that are at a good price range. Including still cameras, in addition to any advice you can offer. Thanks for your nice note. I am so glad you find my site helpful. This single post probably attracts more visitors and comments than just about any other. I wish we could go equipment shopping together. I’d love to help you pick out all your stuff. I always recommend B&H Photo because they carry everything and their prices are very good too. What is your budget? That determines so much. Without knowing your budget it is hard to make specific recommendations. Do you by any chance of access to any studios near you that you could visit? Are there any schools that offer video production? If so, maybe you could go by there, see what they have and talk to them about how well it all works together. Back when I worked as a high school TV production teacher, it took about 80 grand to outfit an entire studio from scratch. We had cameras that were about $12,000 each. I reviewed an incredible new camera from Panasonic the other day, the AG-HPX300. Here is a link. It may be more than what you need, but it sure was an incredible camera. I always recommend Mac computers and Final Cut. For the heavy-duty task of video editing, Macs do a better job and are more stable. I am convinced of that beyond a shadow of a doubt. Reading between the lines on your comment, one suggestion that pops into my head is that you should have plenty of backgrounds. Backgrounds need to be easy to move. This means they need to either be on wheels or they need to be movable curtains. (Or roll-up-able like a window shade) You can even make cool-looking props and backgrounds out of cheap stuff like styrofoam. It is amazing what can look good on camera! Virtual sets can also really add to the creative possibilities without taking up any room at all. Using virtual sets requires green screen. Even if you do not use virtual sets, green screen is very versatile. So make sure to have one area of your studio devoted to green screen. It helps to paint the floor green in addition to having a green cloth. Painting the floor is easier than having to lay cloth out on the floor, plus people will trip over the cloth, still some studios use cloth because you can move it. Can’t move paint! Thanks for your prompt response! Once again, YOU ROCK! I would visit a studio on monday and get some insight on what equipments hey have. That way, I would have more detailed questions for you. Hey Loraine, great job. Kudos. I am looking at setting up a video editing & sound production studio, (post production actually). What is your take on this as per equipment. I will really appreciate a detailed list of hardware and softwares to start with. Note: My budget is just 15 grand. For video editing, my money is on a mac pro with Final Cut. If you are going to do a lot of video editing, get the biggest, baddest, most-of-everything Mac Pro you can afford. Get multiple hard drives, at least two internal hard drives and however many externals you need for your work load. Mac operating systems or more stable. No two ways about that IMHO. Mac pros are huge and powerful, which is what you need. Big league video editing takes power unless you want to crash all the time. Also, get a big monitor, or even two monitors if you can afford it. Detailed Video editing takes a lot of screen space to see what you are doing. Sound production alone is not my forte so I want to stick with video editing. I will say that one cable that is essential is one with an XLR on one end and a USB2 on the other end. This way you can record audio tracks directly into final cut. That will save you a step. Obviously if you are mixing professional sound production with video editing you need to directly transfer lots of audio, so this cable will be your best friend. Get a REALLY GOOD battery back-up power supply system with PLENTY of capacity. A huge computer like what I am talking about draws lots more power than a standard PC. Talk about apples and oranges! If your APC back up does not support enough wattage it does you no good. I will taping (4) 1 1/2 hour lectures. The presenters want them on DVD’S. preferebly (2) lectures per DVD. I have 2 questions. #(1) should I burn a 3 hour DVD or a 1 1/2 DVD. #(2) I am recording on a JVC GR-JVL720 mini DV, should I record directly to my computer or an external drive and what type of microphone should I use to capture the audio while recording. Is there something I should attach to the camera or computer. That is 6 hours worth of lecture. Whew! The amount you can get onto one disc depends on the file sizes. The files size will depends on which format you choose and what kind of resolution quality you select. You will lose resolution quality if you go down in file size. Whether you want to make that trade-off to get more on a disc is up to you. The usual process is to can record it on the actual mini dv tape and then capture that footage later in your computer. It always helps to have an external hard drive because that gives you much more storage room but you do not have to. You might be able to simultaneously record it on your hard drive if your camera will output as you record but most cameras will not do both at once. Plus, you usually have to output your video when the camera is in VCR mode, not camera mode. It can not be in both at once. To pick out a microphone, look first to see what kind of microphone jack your camera has. Any microphone that will fit into that plug will work. It will either be a small mini jack or an xlr input. The microphone should be close to the speaker’s mouth. ustream has various ways in which you can utilize their service. The most common way is to stream something live on their site, then embed it on other sites. But you can also use them to stream it live on any other site you have. A webcam will keep it simple and for most needs would probably be sufficient. You might need more, depending on what you are actually trying to accomplish. I hope this helps you. email me if you need to. Hi, you are doing a wonderful job,God gives you more grace to your elbow! I need you to give me a simple budget for video production studio as for a beginner, and if panasonic MD10000 can do the job, moreso the list of complete equipment for the studio. I looked up the Panasonic MD 10000 video camera and it would indeed do a good job. Did you notice it is on the PAL standard? I do not know where you are from, but the PAL standard is euopean, not USA. If you leave where they use PAL and not NTSC, then this camera would be great. This post contains a liost of all the equipment you need. Please copy off the list that is already in this post. To Jeff: if you want live switcher application, try boinxTv. It does what you need. Make sure you have a Mac with a high end graphics card. (i.e. Macbook pro, iMac and Mac pro). Thanks a million for the great tip. boinxTv is absolutely incredible and I need to post more information about it. It is amazing to me how software can replace so much equipment. First it was editing. One program can now do what it used to take a room full of equipment to do! Now with software like boinxtv you don’t need half of what I talk about in this article. Software and technical advancements make video production more accessible to the average Jane and that of course is a wondrous thing IMHO! The minimum cost for setting up a video studio is going down all the time because everything keeps getting consolidated into the computer and different software packages are replacing some of the equipment needed so that makes it much less expensive. Today you can set up an entire studio for less than five grand. I work in a Yellow Pages company, and I am proposing a plan to set-up a small studio/ art department for developing small 20-45 second ads for our clients, which will eventually be displayed online or on a mobile based GPRS browser. We basically want to get into the video yellow pages marketing segment, online. I have a very basic idea of video production as I have worked on short films and a few editing jobs before. But I could really use some help figuring out what are the components I need to look at in setting up such a studio, lest I forget something important in my proposal to the big-wigs. I am looking at a small set-up with about a maximum of ten people, including camera operators, creative ppl etc. I’m looking to shoot in digital, HD possibly, a small studio set-up with lighting to shoot basic ads. Though most of our clients would want us to shoot on location at their premises. We will need a sound booth set-up for VO work. And basic windows based editing systems. These are the basic things I see in the set-up, but I have a nagging feeling I am missing something(s) extremely important. We are based out of India, so the prices are definitely going to wary. But please do give me, what you think will be an estimate to set something like this up, with any other components you think would be necessary for such a set-up. You ask some really good questions. It is difficult for me to give you a cost estimate because what level of equipment you choose would make a huge difference. In other words, you could use $1,000 cameras or you could use $100,000 cameras. You could save money by getting the software that integrates many of the studio components listed above into one software package. If you are doing online Yellow Pages, I personally do not think you need HD. If you are going to be shooting on location, you will want portable lights and perhaps a portable green screen. It does not seem to me that you are missing anything. Have you thought about things like cables? If you would like for me to spend some time researching equipment for you, please contact me for personal consultation. Thanks. Lorraine. Interesting site with some useful info. However, the statement from Internet Video Gal that “today you can set up an entire studio for less than five grand” is misleading at best. There is no way you can adequately equip a multi-camera facility with audio, video, lighting, communications etc… at that pricepoint with anything approaching pro quality. An “internet” studio with a webcam, computer, and mic maybe, but not a facility that can withstand significant use and provide reliable, high-production values results. Of course you can not set up a PROFESSIONAL studio for 5 grand. I never said you could. This site is aimed primarily at people who want to do internet video. Many people who make professio0nal video can not get around the fact that not every video needs to be top notch technical quality and that cameras less than 20 grand are worth using. You absolutely COULD set up a studio worthy of making quality video for 5 grand. And you could go WAY beyond a webcam. If all you need is a webcam is does not take 5 grand! You can get a webcam for 50 bucks. If you used home level video cameras, just a few lights and a cheap switcher (or now software) you absolutely could set up some kind of small studio in your house for 5 grand or less. I’ve done it and so have some of my readers. I am not telling people they can set up Warner Brothers studios for 5 grand. Firstly, THANK YOU for sharing your knowledge with all of us who aren’t as knowledgeable as you. I am looking at setting up a small video studio to film some tech help videos, what kind of equipment do you think I would need? i already have a sony camera. Thanks for any help you could give me. Good to hear from you. Glad if VPT helps you. From the little you have told me, I’d say it might be best for you to get an edit system to go with your camera and not set up a studio like I talk about in this post. Get a real powerful computer for your edit system if you go that route. I have a Mac Pro. If you have one camera and an edit system, you can do a lot and that is more functional for most situations and certainly if you are on a budget I think that is a more practical way to go than trying to set up a multi camera studio. I have been looking at the Adobe creative suite production premium. For a computer, I already have a MacBook Pro. Is there any other software you could recommend? Adobe creative suite production premium is FANTASTIC. You can do so much with all of that. For basic video editing, you could probably also use the imovie on your Mac. Or, if you want more control and capacity go for Final Cut Express or Final Cut Studio if you can afford it. FCS is one heckuva software package that does just about everything! Then you should be good to go! Good luck! Keep in touch. This is a great forum, and thanks for all the information. By the way, I see that you recommend B&H for video products; I am a B&H satisfied customer. Now, look at my production at http://www.cneworld.tv We are trying though, for a home garage mini studio with virtual set. My question is about the cost it will take to rent a full studio, space and equipments only, for a production. I know you will want some details; 25×25 feet space including green screen, computers and all the software needed, cameras and all the accessories (tripods, mic. etc. ) lighting. Just give me a rough idea base on your knowledge. So glad to hear from you. B&H is indeed the place for video equipment! I looked at your site and think it is great. Congratulations. If you want to rent out a studio I would suggest you contact the TV stations in your area, particularly the PBS station or the small independents. They will give you the best rates. You will probably pay by the hour, or get a half-day or full-day rate. It might be up to $500 an hour. That should include people to operate all the equipment plus the equipment. Most of the places I worked where they rented out the equipment actually preferred staffing it with their own people since they were well versed in the equipment. You might also try calling up some area businesses like wedding videographers or event producers who have mobile studios. Maybe they could come to your location. Find those who specialize in lower budget productions or else it will add up to the $50,000-$100,000 range real fast. Well, if you want a certificate for completing the home study course that could be arranged! I should make a pdf downloadable one. Cool idea! Thanks! I would like to start up a local-cable-tv-channel at a prime location in India? I have no idea about any technical requirements for the same? Could you kindly assist what are the basic things should I considered for setting up the same? Good to hear from you. Setting up a local cable tv channel sounds exciting. If you read this article and all the comments, plus click on the link in the post to the companion article that also has a lot of comments, then I believe you will get plenty of information about what kind of equipment you will need. what would i need to upgrade a casting studio, from tape recording workflow to tapeless? I know i can record directly to a computer hard drive in the studio with adobe’s on location, but then, how do i connect the files on the studio computer with the other editing rooms (wich are next to, but in other physical rooms? (i mean with kind of conection) and then to the net? Without actually looking at everything it is a tad hard to say for sure but probably with firewire. Maybe USB2. You might need some converters. What kind of cameras do you have and what do they output? Do you need to have them connected all the time? If not, consider using external hard drives and those can be connected or moved. If you would take the time to read through this entire post and the comments, you will see lists of all the equipment you need to set up a video studio. I have the following question: what would it take to set up Internet TV video studio? Ideally we want to do live broadcasting of panel discussions. In addition we’d like to be able interact live with remote audience. Your momma was real clever with your name! 🙂 For panel discussions you would really need at least 3 cameras and each person would need their own mic. If I were you, I personally would go get a New Tek VT5 if I could afford it. Interacting live with a remote audience would be more of a function of your video platform not your video equipment. Covideo will let you interact with audience members face to face if they have a webcam. There is a chat function too. iStream is a very popular choice. You have audience interaction via chat. I hope this helps you. Thanks and good luck! Great link you are to a yearning world of videographers and independent filmmakers. Keep up the good work. I will appreciate a detailed guide on how to connect my audio link to my console and to the mixed video. Also, what can you advice about JVC Everio GZ-HM400 HD Camcorder PAL and JVC GY-HM100 HD Camcorder; and the kind of equipment they’re compactible with. Thanks for visiting Video production Tips! A PAL camcorder would be one set to the European technical standards, NTSC is the American version. So please buy a camcorder that will work in your country. The JVCs you mention are both very nice camcorders. When it comes to your question about connecting your audio link to your console and to the mixed video I must confess that I am not 100% sure what you are asking. Adding audio to a mixed video is done in editing of course; you simply add the desired audio to a new audio line in your editing timeline. That may not be what you’re asking though. Hi I want to set up a professional modern video production house in my country a studio that can host audience and i need help on the necessary equipments to buy and where to buy them. I am writing a business Plan for a TV station and I am having a problem writing the technical part of the whole project! I will really appreciate if you help! Looks like you have your work cut out for you! The crew members you will need are listed in the post. I will email you my equipment catalogue so you can read more about cameras to decide which ones are right for your studio. That should do it! Good luck. I am working at an international college and the management are in the process of setting up a new course in mass communication and advertising. They are planning to convert one of the lecture rooms into a broadcasting/recording/editing studio, and I’ve been put in charge of doing the layout and design of it (because I have an interior design background). I’ve no experience in designing studios and after doing a little research, I found the technicalities quite hard to understand. Thank God I came across your site and it made things so much simpler. However I would still hope if you could give me some advice on how to set up a broadcast/recording studio.. The main difference here is it is for students to learn, and it does not have to be too geared for commercial production. In your opinion what kind of set up or equipment would be just right for students to learn about basic broadcasting? Also, I’m not sure which room should be adjacent to which other room, or what equipments should be grouped together in a space. I am planning to visit a radio station to find out more and hopefully I will have better questions to ask later. I am glad you found my site too! I am happy to help. When I taught TV production in a high school, I came to believe that for total beginners, the equipment should really be kept simple. In my opinion, what people should learn first is the storytelling/artistic/creative aspects of video making, not the highly technical stuff. When I tried to give my students the huge, complex professional cameras they were overwhelmed and could not really get past that to function well. But when I handed them a home camcorder model, they joyfully went out and made great videos. Now, having said that, I was grateful for the huge professional cameras too, I certainly thought they should learn how to operate them, but that came second, after they got the feel for what they were doing with simpler equipment. So I guess what I am saying is that it is good to have two (or even more) levels of difficulty for students as they advance. We kept the big cameras in the studio where I was there to help. The smaller cameras were used as field cameras. Using less expensive simpler field cameras also made it possible to have a lot of them so all students could be accommodated and we did not have to have a waiting list. Now, as far as layout of the studio goes….make sure that you have a control room that is sound proofed from the studio, but one where people in the control room can easily see what is going on in the studio. You communicate between the two room using headsets, but for a learning situation, it is critical to be able to see what is going on with your eyes, and not just with the cameras. Usually this is accomplished with a big window. You can not just have an open space because noise from the control room will interfere with the audio recording going on in the studio. The narrow area you describe sounds good for a row of editing computers. Students absolutely need to learn editing. I always recommend Macs for video editing but whether you get PCs or Macs, get powerful ones with lots of speed and RAM. If you have a little something in your budget for professional consulting, I can help you even more and will lay it all out for you and give you a loist of equipment to purchase. Drop me an email if you would be interested in that. In the meantime, I hope this information helps you out! Thanks so much for the info! I am impressed that you really took the effort to answer every comment in this page. Actually just a couple of weeks ago before I was tasked to do this studio, the management has apparently came out with a list of equipments that they intend to purchase for the studio. I’m not sure if they asked for any professional consultation on this, but I got the list anyway, and I think it will provide an idea of the college’s budget. They’ve selected Panasonic’s VariCam 3700 or 2700 and Sony’s HandyCam; as for studio lighting, they’ve listed a 2.5kW compact HMI, Aspherics light head 100W/150W tungsten, Dedolight, standard barn door (I have no idea what is this for, lol) and a power supply 24V/150W(230VAC). The remaining equipments are a control panel, a telco interface, a mixing engine, AES, Audio I/O and a Mac. I think they’re being very very general with the things to buy yet as nothing on it are specific. On another note, what are the differences between a broadcast studio and a recording studio? Thanks again for your explanation! The main difference between a recording studio and a broadcasting studio would be one has transmission capabilities and one would not. A barn door is a metal gadget with movable slats that you attach to a light to help you direct and point the beam of light. I am glad if this information in this post helps you. All of the comments on this page add a ton of info! I always answer comments if they are sincere comments and not spam BS or some transparent attempt for an irrelevant link back. I get tired of those but enjoy helping everyone else. Thanks! thank you so much for the great help you’ve been rendering. I want to set up a complet tv studio that will be airing the following programmes; news, sports, movies, musics, documentaries, talks, intervies/views etc. With a work force of about 30 persons. Pls i want you to mail me the list of equipment needed and their prices. I also want to know if my budget of 350000 will be too much or too small. Thanks and God bless. Precisely what equipment you purchase depends on several factors so I can not really mail you a list of specific equipment and the prices. You can set up a fine studio for $350,000. $350,000 would get you top-notch professional equipment. If you need to get by for less, you can. I will email you directly or you can write to me at videoproductiontips@gmail.com and together we can figure out precisely what you need. I’ve read this whole post and I got a lot of really good information from you. I have a background in professional audio, but know next to squat about video! I’m checking out BoinxTV and have a couple of lower end cameras in mind….I’m setting up a really simple, portable, one-camera video setup and I have a question about lighting. I’m looking at inexpensive lighting kits on ebay, and I notice two basic types….white umbrella that the light shoots through, and silver reflective umbrellas that the light reflects off of. I also notice florescent versus halogen. Could you comment on this? There are some pretty inexpensive kits, but I don’t want the color to suffer for the sake of a few dollars. Beyond color temperature, the different types of lamps have pros and cons. Halogen gets hot as heck and uses lots of electricity. However, it is a fantastic, bright light that works well for video. The newer florescent lamps stay cool to the touch and use little electricity. They provide a nice diffused light for video. Not quite as intense but that is not much of a con really. Thank you Lorraine! That was a very informative reply to my question. Any comment you have on that are greatly appreciated. Thank you again. The differences in the methods you describe are going to be subtle. Passing the light thru the umbrella diffuses it and so does bouncing it but just to slightly different degrees. The softbox set-up also has a few variables, like you describe. The cloth checkered thing you attach to the front of the soft box helps focus the light it is not an additional diffuser. The cloth front of the softbox itself does all the diffusing. When you get into professional lighting gear, there are multiple ways to achieve diffused light. All of them are fine, just slight differences in the amount of diffusion, direction and the intensity of the resulting light. There is no one right way or wrong way. I hope this helps. The issue you describe is caused by the software, not the computer itself. If you can not get Mac there in Zambia I would not worry about it. A PC can be a great editor too. Here is what I think is happening. The software reads each movement as an independent clip. Is this because of the time code setting on your camera? The edit software reads either the time code or the control track laid down on by the camera. If the time code setting is not set to record continuously, then each time you pause the camera there will be a change in the time code and therefore the computer will read each as an independent clip due to the time code break. If you change the time code setting, it will keep a continuous time code going even through pauses in your recording. Then the edit software will not see a time code break so it will not create a new clip. I hope this explanation makes sense. I am not 100% sure that’s the problem, but I’d bet good money on it! Try that and see if it helps. A thousand thanks for your quick response. I will try that. Imagine a you have a 3 tapes shot in LP and you end up with a lot clips in your bin folders. It was cumbersome. Again thanks a million times for your response. Yes, that is very cumbersome. A pain in the tush one might say! Another thing…Always shoot with the tape speed rolling the fastest. When you say you shoot in LP, are you referring to “long playing” which means the tape is rolling slower and you can pack more stuff onto it? If that is what you meant by LP I would advise you to stop recording that way. Your footage will be more grainy with less image quality in the LP mode. Just another tip! I am looking for 3 professional studio cameras,(new or used)but I have a low budget about max 20000 euro`s. What do you propose me to buy? 20,000 Euros isn’t that low of a budget! Here is a real nice Canon for just under $6,500. Technically it is a field camera but you can use it in the studio. I have a full setup 10K transmitter and full tv studio equipment available from channel 48 in columbus ohio for sale. I’m interested in doing some sports marketing, what type of equipment would I need for video editing. Where’s the best place to find Industry Software? To edit video, you need a computer and some video editing software. There are dozens of software products to choose from. Everything from free programs to ones costing thousands of dollars. You can use any kind of computer, but the bigger and faster the better. Here is a link to a blog post about the best free editing programs. I have not personally used the Boinx TV but I think it looks great. It is recommended by several very trustworthy sources. It would probably be a good and economical option for you. With your 22 new imacs, it sounds like you will be having your students do lots of video editing. Get cheap, easy to use field cameras. With students, the first things they need to learn have to do with the cooperative, collaborative process of making video. Hi there- thank you so much for this amazing page. I do not have any production experience, so my questions may seem confusing/silly- please bear with me. I would like to set up a little studio for streaming an on-line game show. I will present it myself and would like to manage all of the equipment too (a one-man show). My budget is £10k for the entire studio set up. What are some cameras out there that are around the £1-2k mark that are suitable for an online show? Can you recommend any? I really prefer to have just one camera sitting on a tripod. My basement is where I am setting up- the ceiling is only 8ft high- so will tripod lighting be better? Some websites are selling ‘all in one’ studio packages that include lights and background… are they a waste of money/bad quality materials- most of them are in the early hundreds price range. The basement does have some overhead noise filtering through the walls- I can hear motorcycles rumble and ambulance sounds etc. Are there any microphones out there that will not pick up on general road noise? preferably a clip on? Anyway- I will probably have another 200 questions at some point to burden you with. Thanks in advance if you can help me – I hope Im not getting in over my head. I am an amateur presenter- but would really like my studio to look as professional as possible. Go for it! I think your idea is grand and I know you can make it work. Keep it simple from a production standpoint. Put most of your thought and energy into the creative process. IMHO, you do not need a fancy camera, not necessarily even one in the $1,000 range. In fact, using a camera like that could give you such a huge video files then it will not stream well. Are you streaming live? A small pocket cam or a web cam might even be your best choice. Audio quality is paramount but if you are close to a webcam it picks up fine. A Zi8 pocket cam by Kodak has a place where you can plug in a lavalier mic with a small mini plug. Look into the Boinxt TV software as the heart of your system. That and a high powered computer will work wonders. Either that, or something like the New Tek VT5. That is probably too much for you in all honesty. For lighting, hanging stuff off a ceiling saves room but you do not necessarily need a big metal grid like what they use in “real” tv studios. I clip lights onto the ceiling all the time with various c-clamps and other hardware gadgets. I am lucky now with an office that has ceiling tiles with a metal grid to keep up the ceiling tiles, which I clamp small mini lights too. SOMETHING LIKE THAT IS NOT STRONG ENOUGH FOR BIG HEAVY LIGHTS, I clip small lights to that grid. But my point is, depending on what kind of ceiling you have, you can do your lighting in various ways. The biggest advantage to lights on the ceiling is that takes them out of your way. Lights on stands are easier to move around. Depending on what kind of camera you use, your light fixtures do not necessarily have to be super powerful. Reads these articles on lighting. A webcam will be overpowered by “real” TV lights. In order to comment on the studio packages you are looking at online, I would have to see them. Think of this though…How much background do you really need behind you if you are the only person in the shot? Not much. Your shot should be a relative close up. You can gather nice looking props (vases, clocks, statues, plants, etc.) from around your house and use those. Or, use curtains. Your background can be simple, and should brand you in some way if possible. No microphone is going to cut out background noise as you describe. Put up some sound proofing foam on the walls. You can even build yourself a portable sound booth will sound proofing foam glued onto cardboard. I hope this answers your questions! Good luck! Stay in touch. Setting up a small video/audio studio for live broadcasting with a minimal production team. Will be recording for webcast one on one interview (2 persons and exceptionally 2 interviewees + 1 interviewer). Would like to go wireless if that’s less expensive than using cables. Need flexibility to use cameras for field reporting or shooting outdoors video programs. Need to know whether HD quality cameras are needed to have high quality professional programs or whether an inexpensive camcorder mounted on mobile tripods can do the job. I have18,000 dollars budget to have a complete studio ready to produce live programs (3 cameras + 3 tripods w/ dollys; 3 microphones; video/audio switcher (although I already have a good audio switcher; graphics generator; lights and mounts; CD player; DVD/videotape player; head sets; 3 to 5 monitors). I am also looking forward to using a powerful computer to manage sound and video production. Thanks a lot for any advise you may be able to send me. I’d say with a budget of $18,000 and the desire to use a powerful computer, you should consider something from Boinx TV. A more expensive alternative would be something from the New Tek line but that would really be more than you would need. It’s both good and bad that you already have all of the equipment you state. You will not need to buy a video switcher if you use something like BoinxTv software. Using any computer program eliminates the need for accessories that were always mandatory before. You would also not need the graphics generator and audio board you already own but honestly, from a user-standpoint it can be easier to control an audio board with real knobs rather than virtual ones. Using wireless microphones is more expensive that using wired mics. You might want to budget one wireless mic for certain circumstances, but you can save money by using wired mics as much as possible. Otherwise, you can get high quality sound with a wired lavalier in the $100-200 range. Even ones costing $20 sound fairly well. For webcast, it is not necessary to have HD, although many people would argue that it is. Good lighting on SD looks better than bad lighting on HD. Lights is one thing you already have, so you can save money there. Another budget saver is to think about skipping the dollys. Camera people can pick up and move small camera and tripods easily. I hope this helps you. If you need further assistance, please email me to set up some paid consultation. Thanks for visiting VPT! Thank you so much for the amazing tips you are giving us on this website. I would like to set up a TV station (analogue); but I don’t what I have to buy for the studio and transmission (set up from scratch). Can you please help me out with things I have to buy and where to get those items to buy? I’m already considering adding the TV Software you guys have being talking about; but I am still open to suggestions from you Gurus. B&H Photo has both new and used equipment video equipment. I suggest you try them. They ship anywhere in the world. Contact me if you want one-on-one help. Thanks! I hope this helps. Ive been reading all the info u post on the website and its amazing. Ill keep reading, but i think my questions havent been aswered (directly at least) on other posts. Anyway, i have to set up a live tv studio in argentina. Since digital tv is growing they dont want to get old broadcast cameras (they also want to have a portable equipment). Thats why i was thinking on 3 SONY EX1R cams; Sennheiser G3 mics; a reduce set of lights (with capability to do chromas) 2 cyc lite, 2 powerflo, 2 fresnel 1kgw, 1 fluo spot. What i found hard to solve is which switcher i should choose and whether to use or not an external audio mixer; plus which tape recording system i should get (Digital BETA? or HDD?). What about cables and connection stuff? am i missing anything??? Thanks for visiting Video Production Tips. Yes, I would suggest you get the New Tek Tricaster or the VT5. Either one. Those handle audio but some people find it easier to have a separate audio board. Audio levels are a bit hard to control by mouse, plus depending on the size of your crew, it can work better to have audio and video separate. You will not need a separate titler or character generator. Make sure and get tripods and an intercom system for your crew to communicate plus monitors. Microphones too. Hi, Final cut can do a lot, but it can’t be using as a live SWITCHER. Even on the X ver sion comming soon on June. You probably need a Newtek and/or a Datavideo Live video Switcher. Those model are cheaper. You can find them easily by googling a little. If you have more budget, I’m suggesting you GrassValey Stuff! Hi, Yes, you are right, which this to[pic is covered above and you have repeated what I already said. Why don’t you check into this low cost video switcher and camera. 1. I have a Dell Laptop Inspiron 1764 and a Yamaha MG102c Mixer with a External E-MU 404 USB to get my sound into my computer. I also run a dual monitor system and own a cheap AIPTEK GVS HD Video Camera (Don’t laugh it was given to me for a gift). I also own about 4 dynamic microphones and 1 MXL 901 Condensor Microphone with phantom power and a cheap wired Audio Techinca lapel mic. The video camera has an external mic hookup and I am trying to figure out how to use that with my mixer board for routing the audio to it if it is even possible. Can you help with this? 2. One other thing I do is make screencast videos using Camtasia Studio 7 and I would like to be able to use that cheap AIPTEK GVS Video Camera and switch back and forth from me(on the camera) to the computer monitor(Software App) I am teaching without having to do any production. What I mean is saving the video from the camera and then producing the Camtasia Video and having to produce it again. This takes a lot of time so I was wondering if there is a better cheaper way to accomplish this with what I have and maybe a software that would do this or a cheap video switcher that will work with my setup. I would also like to live greenscreen myself over the software application or with a different background in the near future so take that into consideration and if possible give me some ideas or equipment needed for both scenarios please. Thanks for any help and I will wait for your reply. I work as a volunteer with kids and adults with learning disabilities and would like to start teaching them some things and how to create their own videos and get good quality audio setups started. Keep up the great work and thanks for having such a great site. Is the transmitter and full tv studio equipment still available? I do not sell equipment off this blog. You can purchase the equipment from B&H Photo Supply. Thanks for your comment, but honestly, I do not have any idea which broadcasters would be interested in documentaries about S. Africa. Sorry. As you’ve heard before great article and information. I’ll begin my question by giving a little background info. I’m an electronics engineer with extensive professional audio background novice professional video (Broadcast) background. With that being said, I was contracted at the finishing stage of a towns new public safety building to install a broadcast sound system (the original contractor defaulted at the last minute) that will be used for their town meetings and capable of tying into their broadcast video system. That was completed with no issues. They have since contracted me to complete the video portion (video contractor defaulted). My issue is interconnecting their existing equipment with the remaining equipment needed. The existing video equipment they have(all Panasonic)is: AW-HE50H HDMI Camera’s(5), AG-HMX100 A/V mixer/switcher (All of the camera’s are wired, both video and Cat6 control lines, back to the control room and ready for connection). Do I need to interconnect the PTZ controller with the A/V mixer? If so, then I can’t use the 50 series controller (AW-RP50) as it is only compatible with the AW-HS50. Panasonic does show that their AW-RP555N and AW-RP655 are compatible with the AW-HE50H cameras, but I can’t find how either of these would interconnect with the AG-HMX100 or if they need to. I hope I have not confused this too much but I am really at a loss as to where to go from here. Sounds like you’ve got your work cut out for you! I always hate to say this kind of thing, but honestly, I do not know for sure. You need to ask Panasonic. I do not think the PTZ controller needs to be hooked up to the video switcher but I am not 100% sure. Without being there, it is hard for me to say. Sorry. I am happy for this site.All that I’v heard ve inspires me.All I’v being hearing is about video I need something about photography. I have a question i have been involved in the audio industry for years and have the best of the best for audio and the equipment for every format for audio from lp, cd, minidisc, cassette, 8 track reel,dat, adat.. Instead of using a standard switcher, maybe you should try BoinxTV, the computer software that so many people use for live web streaming. thanks for the reply, were looking to do live broadcasts hd and eventually do syndicated TV, also, not just web based.. so that’s what i am trying to figure out and also if the cameras i listed and software’s would work for this along with either a avid card or black-magic. but our plan is to start with audio streaming first what i already have the required equipment for and beyond and then stage two go to video, and were working on the equipment lines for the video part now and trying to see what we need for totals, so far i am guessing the following configurations. Switcher for switching behind desk for multi preset view cameras, for camera 1, close up, camera 2 for default setting and camera 3 for alternate view. Maybe this datavideo switcher would be work for you without breaking the bank. Great! I would appreciate that. we are founding the company for tv and production house please we need every equipment needed to run this buiness. I want to setup a video recording studio and streem live on the internet. Any idea how i can do this. I work at a high school and we are trying to start student broadcasts. We are starting from scratch. We have a small room with an adjacent control room. We are looking into Globecaster software. If we have this software, do we still need video and audio switchers? I wish you could just flat out tell me what we need. My list currently consists of 2 cameras, dollys, video and audio switchers, 2 pin-on mics, 1 handheld mic, teleprompter and I’m totally lost on the lighting. If you have an itemized list of atual products that I should get I would be so grateful. Im sure you know what a high school budget is like so it’s not like we can spend millions. ANy help would be appreciated. I certainly do know how a high school video budget is so let’s see what we can do to help you stay low on costs. I do not have an itemized list but in addition to the equipment you mentioned, have you thought about computer editing systems? You could certainly just keep your class doing studio production and not field production but field production can open up a lot of possibilities. Don’t forget both audio and video cables. To keep lighting simple,you should probably just get two portable lights on stands with umbrellas. Either one of these would do. One is a tungsten so it is less expensive, the other is LED which does not get hot and might be safer around kids. I have personally never used the Globecaster software, but I checked out their website and demo videos and I would say you would certainly not need a video switcher, but you might need an audio switcher. Even if the system will handle audio, it is usually easier, especially with multiple crew members, to have a separate audio switcher. It can be too squished together to have both on one. Good luck. I hope this information helps you. Thanks so much for getting back to me so soon. That is a big help. One more thing, do y recommend a certain camera or mic? There are so many cameras and mics on the market it is hard to say without knowing more about what your budget is and so forth. Make sure that all your inputs and outputs match. In other words, if you have a microphone that has an XLR output, make sure you have an XLR cable and if your camera only has a stereo plug audio input you’ll need the appropriate adapter cable. Glad to hear you like my blog! Sounds like you have entered the world of video production in a very efficient way! Good job. 🙂 Keep it up and thanks for your comment! WRT to the following text from your article, what would your equipment list look like? Thank you for an awesome blog. I am about starting a mini (low cost) television station here in England. Please advice me on the equipment I need to buy. I intent to play clients recordings/tapes and have a small studio for some live broadcast. To outfit a video studio you have many choices and indeed it can be terribly confusing. The information in this post gives you the basic types of equipment you need. Because there are so many variables and options, it is impossible for me (or anyone) to just hand you a list without knowing much more about your specific needs. If you would like to hire me for some personal consulting, please use the form on the Contact Us page to reach me. Thanks. We are revamping our studio lighting at our Boston high school. It’s a good space, at least 30 feet by 20 feet, and we want to know the basics in a grid lighting kit. Can you advise, please? We need to submit our budget in a week! Thank you. I am Amarsinh Jagdale-Sarkar owner of aBNNI TV, willing to launch News TV channel from Small town Kolhapur (Maharashtra state-India). willing to broadcast News, Interview & talk shows main. May i know how much cost need to startup broadcasting over-cover across maharashtra state? Can you guide me for setup medium size studio with necessary broadcasting equipment’s list ? Please use the form on this page to send me a private email about doing some consulting for you. I have learnt a lot after reading your article.You’ve really enlightened me.God bless you. Hi Lorraine I love your postings and what u said on it but I would like to know if what I am telling a friend that I have is ok or not she have a small TV show here on the eats coast and she is taking advise from a guy that do theater to do her show I was looking at her show and I pointed to her a few stuff that she can do better fr her show and some of this stuff ae the placement of MIC’s and the back ground on the set that to me they do not look good my question is whee is the best place to set up MIC’sand what color will be the best for Background on a TV set up I am trying to include a link to her show like that you can see what I see https://www.facebook.com/bellaskin/videos/10212184451917980///https://youtu.be/MQ2nE6mRRfI this are 2 of her link to her show but they are more on youtube look at MIC position and size and the always dark color background that I think is wrong you let me know I think that a more bright color like red or any other color NOT Blue or Green will help her better and a few Boon Mic’s or lavaliere will be better for her can you please tell me .thank you for your time you can answer me to my E Mail add any time if you want thank you again. I tried to view the video at the link you provided but FB said it was unavailable. Generally speaking, the mics should be made to be as invisible as possible, but I have seen it look nice too when the mics are quite prominent in the shot. Precisely where it should be located depends on the type of mic. Different mics have different pick up patterns so you have to place it according to the pick up pattern. Hello ! I am starting a youtube channel ,and i will be doing a talk show every tuesdays. I am using my entire living room for my youtube channel and talk show. Can you plz tell me what will i need exactly to set up a good setting using camera , lights etc. Hope to hear from you thank you ! It’s very nice info! but could you please give me some info about the budget for a simple video production studio? There are so many options for a studio setup that it is impossible to quote any price accurately without knowing more about how you will use it and what you wish to achieve. Without knowing more about exactly what you want to do and can afford, it is hard to tell you to buy anything specific. Having an entire video studio set up can help a studio make multiple videos at once due to the number of equipment available that can let one person crank out lots of output across the span of a single day while allowing for same-day edits to take place. At the same time, taking advantage of investing in a virtual studio set would drastically help cut down on the money that would otherwise be spent on investing for entire furniture set in the studio proper so that things can go even quicker. Now, if I had the chance to be able to get a virtual studio setup rolled out in a video recording studio then I would gladly take advantage of it! You make very good points Adrian! I would love to take advantage of a virtual studio setup too. They sure can make a fancy-looking video set easy.